In mid-September, the Federal Reserve unexpectedly announced that it would continue purchasing mortgage-backed securities, a move that some feel could keep interest rates fairly low for the remainder of the year. Savvy buyers, however, will want to be prepared for a worst-case scenario. For example, let’s suppose that buyers who are upgrading their home will spend about 35 percent above the median sales prices, which was $715,714 across Pacific Union’s seven Bay Area regions as of September 9. Let’s also assume that the median sales price in the region will increase 12 percent annually and interest rates will climb 1 percentage point per year. 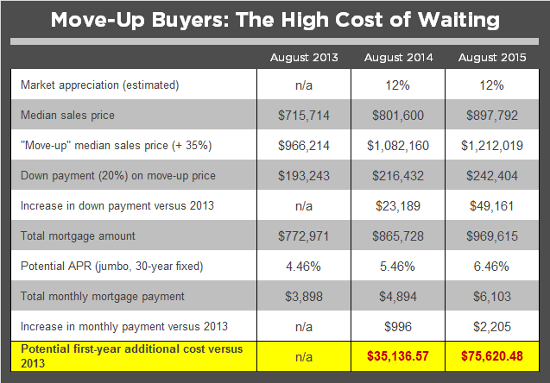 By that math, move-up buyers who delay their purchases for two years could spend over $26,000 more each year in monthly payments, as well as almost $50,000 extra for their down payment. Click to view a larger chart. Some people have already worked out the math. In San Francisco, one of our top real estate professionals notes we are seeing the most activity in the move-up-buyer population since the recession. In Marin County, increasing inventory has spurred an uptick in purchases by move-up buyers, says Brent Thomson, Pacific Union’s senior vice president in the region. Out With the Old – But How? Whether they’re primed to act now or not, Bay Area move-up buyers face one dilemma that first-time buyers do not: They not only need to find new homes in a hot market, they also need to sell their current properties. That’s not a problem if you’re flush with cash. But if you have limited funds, you might need to sell your current home before buying a new one or negotiate a rent-back agreement, which would allow you to remain in your sold home while you search for a new residence. You might be able to make the sale of your current home contingent on finding another acceptable property, but the success of this strategy depends on market conditions. The approach has worked for some move-up buyers in Marin County, says Thomson, but there’s a catch: “The key is that the house that they are selling has to be priced right,” she says. And in many markets where sellers are receiving multiple offers, they may be less likely to accept your contingent offer when other, clear offers are available. If you’re ready to hop off the fence but don’t have money to put toward a new home, bridge-financing products – short-term loans that can help you purchase a new home before your current home sells – may be a solution. While bridge loans can help ensure you don’t miss out on your dream property while your current one sits on the market, they do carry higher interest rates than regular mortgages. Another option is the REX HomeBuyer product from FirstREX, offered in combination with loans from Pacific Union partner Mortgage Services Professionals. FirstREX’s product enables you to make up a cash shortfall by contributing up to 50 percent of the down payment in exchange for a stake in your new home’s eventual price appreciation or depreciation. As with any homebuying transaction, you should consult with a reputable mortgage provider who can offer guidance on all your financing options. Whichever approach you take, one thing’s for sure: It’s time to come off the sidelines and get into the game, or you risk some big financial penalties in years ahead.